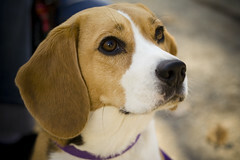 The Beagle is a very popular dog breed. They make excellent pets because of their great temperament and gentle disposition. However, they can be handful due to their stubbornness. Make sure that this is the breed you want before you get one. The Beagle was probably developed by crossing the Harrier and other hounds in England. It has been used for hunting pheasant, hare and quail. It can hunt either alone, in pairs, or in packs. Because of their excellent sense of smell, they are also used for narcotics detection. Sadly, they are also used for medical experimentation because of their uniformity of size. The Beagle is very sweet, gentle, brave, intelligent, curious and lively. They are very sociable and just love everyone! They are also great with children and other dogs, but should not be trusted with cats or other animals unless they were introduced at a very young age. They are never aggressive. Beagles can be very stubborn dogs. When you train them, you need to be very firm and patient. Whenever they smell something, they usually just take off to explore it and won’t listen to you telling them to come back. They will follow a scent and won’t watch out for cars or other dangers. For this reason, be sure to keep them on a leash when you are outside. Beagles can be difficult to train for many people because they are so strong willed. Because Beagles are so sociable, they hate to be alone. If you are going to be gone a lot, I would recommend getting two Beagles to keep each other company. This dog is used to traveling in packs, so they would love to have a friend. If they are kept alone too much, they are prone to separation anxiety. Beagles do not bark like normal dogs do. Their bark is described as baying bark or a howling. It is very noisy and can be very annoying. Your neighbors might not appreciate all the noise. When this dog was used for hunting, their bark was actually a delight to the hunters! The Beagle is a very energetic dog and needs lots of exercise. It is best if you have a good sized yard for them to run in. Daily walks are also recommended. Just be sure to put this dog on a leash for walks or else they will probably run off in search of something. Beagles are a very healthy breed and usually live for twelve to fifteen years. There are some common health problems you should watch out for though. Because of their long, floppy ears, air cannot reach their ear canal causing moisture to sometimes build up. Try to keep water out of their ears so they don’t get ear infections. You should also check and clean the ears regularly. Another problem to watch out for is distichiasis, which occurs when their eyelashes grow into their eyes. If this happens, surgery is often required to remove their eyelashes. Obesity is another problem with this breed. Be sure you don’t overfeed this dog. You should be able to feel their ribs. If they gain too much weight, this can lead to heart trouble or hip dysplasia. Make sure they get enough exercise too. If you are considering getting this dog, make sure you understand how to care for them. They make great pets and are extremely happy, energetic dogs!